Jones & Bartlett Learning Author and Health Policy Expert Joel Teitelbaum Weighs in on the Health Reform Case Before the Supreme Court. Whether the ACA’s individual coverage requirement is a tax for purposes of the Anti-Injunction Act. Whether Congress has the power under Article I of the Constitution to enact the minimum coverage requirement. Whether, if the coverage requirement is found unconstitutional, it is “severable” from the remainder of the ACA. Whether the ACA’s requirement that states expand Medicaid eligibility or risk losing federal funds is unduly coercive in violation of the Tenth Amendment. In this blog post, the second of a four-part series, I focus on questions two and three. The first post discussed Question One, , the third post will discuss the question concerning the Medicaid expansion, and the fourth post will describe the Court’s eventual ruling in the case, which is expected by the end of June. Whether Congress has the power under the federal Constitution to enact the minimum coverage requirement (also referred to as the “individual mandate”) was the headlining issue in the lead-up to the oral arguments. The creation of the minimum coverage requirement has its roots in the fact that, unlike most other industrialized countries, the U.S. relies heavily on the private market to provide health insurance to the population. However, because this private system resulted in serious market failure (namely, 50 million uninsured Americans), Congress looked in the ACA to remedy the failure while retaining an insurance system heavily reliant on private sellers. The result: a requirement that all individuals purchase health insurance, with premium subsidies for certain individuals who lack the means to purchase it on their own and financial penalties for those who ignore the requirement. 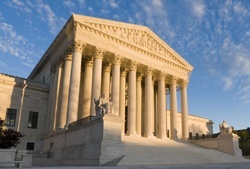 As a matter of constitutional law, the minimum coverage requirement raised two questions that divided the lower federal courts (and the Justices at oral argument): whether an individual’s remaining uninsured (either as a matter of choice or for reasons of affordability or access) is the type of activity that Congress can regulate pursuant to its Commerce Clause powers and, if so, whether the ACA’s coverage mandate is a constitutional solution. In essence, those who argue that Congress exceeded its Commerce Clause authority in passing the coverage requirement argue that while the Constitution allows Congress to regulate commerce, it does not permit the legislature to force individuals to engage in commerce through the purchase of a private-market good. At oral argument, the debate broke along two very different views regarding what, exactly, the minimum coverage requirement aimed to do. On one hand, the more liberal-leaning Justices seemed to view the requirement as a regulation of the overall health care marketplace, and that that marketplace is something in which all Americans already participate (because, at one time or another, everyone needs and uses health care services). Viewed in this way, the ACA’s coverage requirement is a constitutionally valid regulatory response to an existing market that is functioning poorly and, many would argue, unfairly. According to this approach, the individual mandate creates a more stable health insurance system that guarantees access to coverage (and thus, for many people, access to care) that is relatively affordable. Some of the more conservative-leaning Justices offered up a very different view of the minimum coverage requirement. To them, the requirement does not regulate individual behavior in the health care marketplace but instead creates a new marketplace and then forces individuals to buy a product sold in that market. Under this view, the requirement that individuals purchase insurance – i.e., the personal conduct being regulated -- lacks a sufficient connection to commerce to fall inside the scope of congressional Commerce Clause power that the Court has legitimized in the past. To rule otherwise, according to this perspective, would mean that Congress could in the future create other markets for the purpose of regulating them, and there would exist no standard by which the Court could effectively restrain Congress’s Commerce Clause power.